Chill glasses in freezer several hours before serving. Steep tea bags in hot water 3 to 5 minutes. Remove bags. Stir vanilla and brown sugar into tea until sugar is dissolved. Stir in all remaining ingredients except cinnamon sticks. Refrigerate at least 1 to 2 hours to blend flavors. Serve over ice. Garnish with cinnamon stick. You may want to do a little taste testing when you add the brown sugar. Depending on the brand of tea used, you might need more or less sugar. 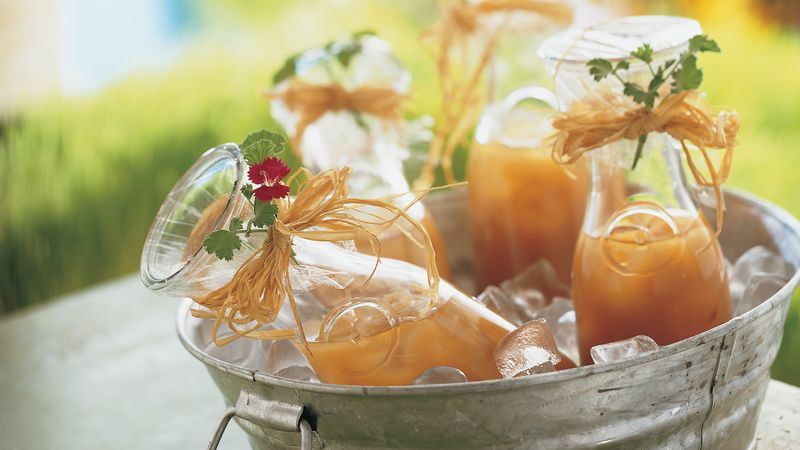 Pour this spicy iced tea into clear bottles, cover with plastic wrap and tie with raffia. Keep chilled in a large clean planter or bucket filled with ice.